The popularity of REST in recent years has led to tremendous growth in almost-RESTful APIs that don’t include many of the architecture’s benefits. With this practical guide, you’ll learn what it takes to design usable REST APIs that evolve over time. By focusing on solutions that cross a variety of domains, this book shows you how to create powerful and secure applications, using the tools designed for the world’s most successful distributed computing system: the World Wide Web. You’ll explore the concepts behind REST, learn different strategies for creating hypermedia-based APIs, and then put everything together with a step-by-step guide to designing a RESTful Web API. Discover how XMDP and ALPS profile formats can help you meet the Web API "semantic challenge"
RESTful Web APIs is the definitive guide to the design of web APIs. We would appreciate it if you bought RESTful Web APIs direct from the publisher through this affiliate link. (You can also use the direct, non-affiliate link.) O'Reilly sells paper books and DRM-free ebooks in a variety of formats. You can buy the book through Barnes and Noble, Amazon, Powells, or Kobo. You can also read the book through Safari Books Online. The book is stocked in most chain and technical bookstores. If your local bookstore doesn't stock it, you can special-order it. 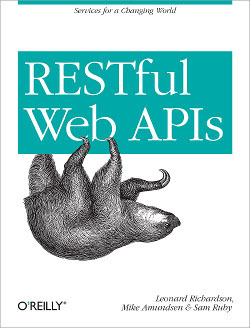 The ISBN for RESTful Web APIs is 1449358063. The sample code behind the clients and servers in RESTful Web APIs is available from the RESTful Web APIs GitHub repository. The "You Type It, We Post It" website and API from Chapter 1 and Chapter 2 are hosted on Heroku. RESTful Web Services is a 2007 book by Leonard Richardson and Sam Ruby. RESTful Web APIs was designed as a complete replacement for RESTful Web Services. The old book has been made available under a Creative Commons license as part of O'Reilly's Open Books project. This document (source) is part of Crummy, the webspace of Leonard Richardson (contact information). It was last modified on Saturday, March 15 2014, 12:15:09 Nowhere Standard Time and last built on Friday, April 26 2019, 00:00:24 Nowhere Standard Time.